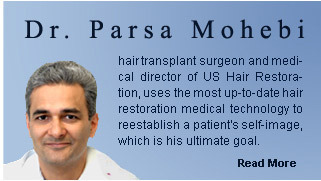 Here at the Parsa Mohebi Hair Restoration, we practice modern procedures which produce undetectable and natural results. Older techniques of hair transplants such as plugs or mini-grafts which cause unnatural results can now have a repair procedure to revise the abnormal appearance to a perfectly natural and refined one. Camouflage and Repair of Large Hair Grafts or Plugs. Old plugs or large mini- and micro-grafts could be easily hidden by removing them and producing a natural hair appearance using follicular unit grafts. This method in selected patients can usually eliminate the pluggy look of hair in one session. The removed hair follicles are used to make follicular units that can be recycled and transplanted. To create a natural appearance of hair with refined follicular grafts, hair transplant surgeons often need more hair follicles that are collected from the back of the scalp. Repair of Unnatural Hair Direction. Unnatural hair direction particularly in frontal and hairline areas can be very disturbing for patients and causes great difficulties with hairstyling. Using single hair follicular units enable hair transplant surgeons to control the direction and distribution of the hair. This is not the case in patients with old surgery techniques using large grafts. The direction of the hair in these patients can be corrected by removing individual hair follicles with an unnatural direction and replacing them with follicular unit grafts in a more natural direction and orientation. Abnormal hairlines are either due to pluggy appearance of the hairline or designing problems. A normal hairline is generally irregular with a transitional appearance in front and a densely packed area behind it. Teh orientation of a normal hairline is so irregular that one should never be able to connect the dots to make a straight line. Transitional irregular hairlines can be easily created by implanting refined follicular unit grafts giving a natural and undetectable result. Repair of Scalp Scars from Scalp Reduction, Cranial Surgeries and Open Donor. Scarring due to scalp procedures such as scalp reduction, old plug surgery, trauma or neurosurgical procedures can be easily filled by transplanting follicular units into the scars. Patients may need more than one procedure in order to increase the hair density in the scar area and to minimize the sharp contrast between the scar and the hairy area of the scalp around the scar.